Wearing mens suits isn't just putting on some clothing and going about your business. Mens suits say who you are a man and the respect that you demand while you're wearing one. 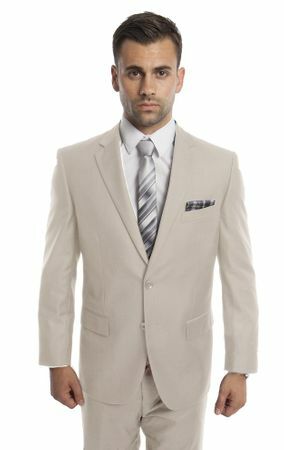 This regular fit tan color suit is made by Tazio and has that perfect Spring and Summer time tan color in a style that will last you for years. These mens suits have double vented jackets with notch style lapels and flap type pockets. The pants are flat front style ready for hemming. Made of super 150s poly/rayon.